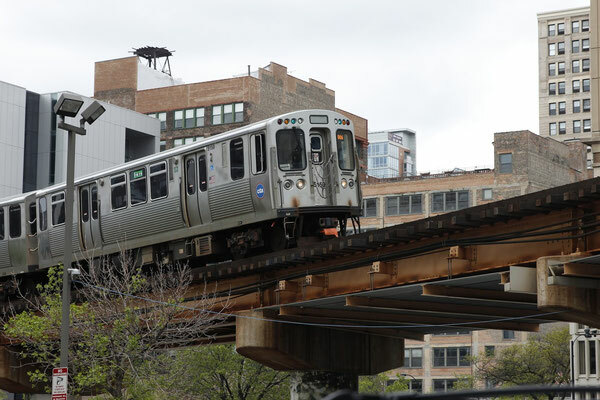 The ’L’ Train is rushing in like a silver lightning on golden trails. Right between beige Art Déco, old clocks and orange lanterns reflecting in the puddles on the brittle asphalt. Skyscrapers are hiding behind the fog and flowers are rustling in the wind. 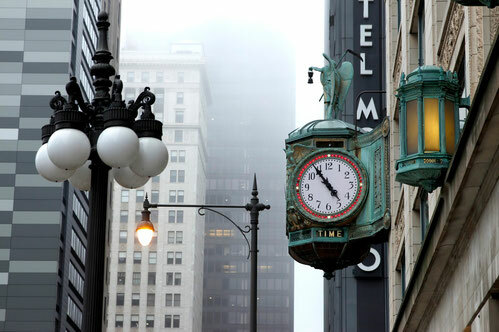 Chicago – a beautiful time machine. Music in the streets, the home of Blues and Jazz. A city made out of water, fire and wind. The flight from Buffalo to Chicago was very bumpy. That’s what this city seems to be obviously about: storm. Like a car on cobblestone the plane was making its way through the dark clouds down to O’Hare Airport. My home for the next week was Pilsen. It’s a Mexican area. There I was living right in an Art Gallery. Together with a nice, older couple and a big, fluffy, black cat. On my first day it was simply raining cats and dogs. My cheap umbrella I bought in D.C. nearly broke. The next days it was a little less rainy but colder. On Saturday only 42°F. Cold and windy but beautiful - Chicago, I love you! 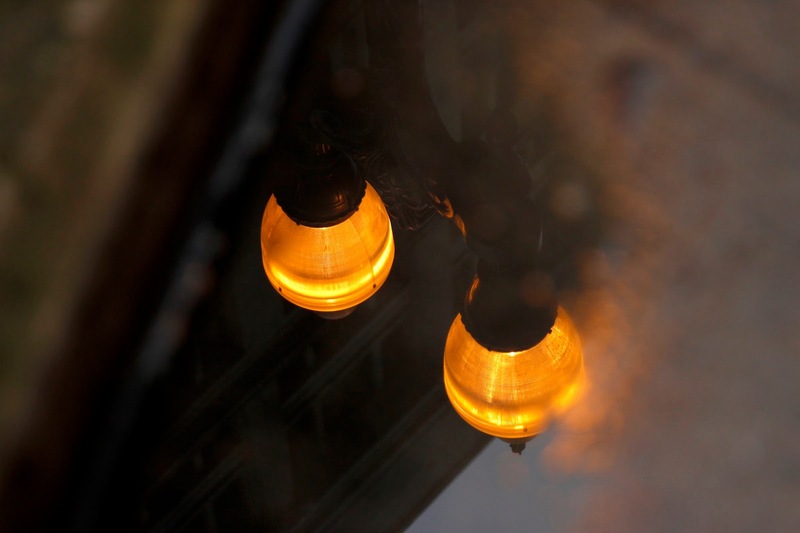 But a city that seems to have a permanent golden shimmer doesn’t need any sun to be charming. 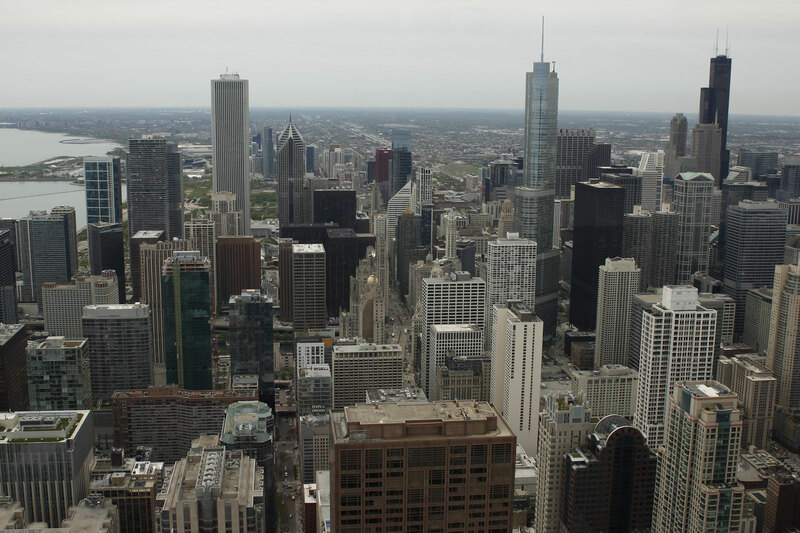 By taking a look at Chicago’s architecture it seemed to be very similar to New York – but better. 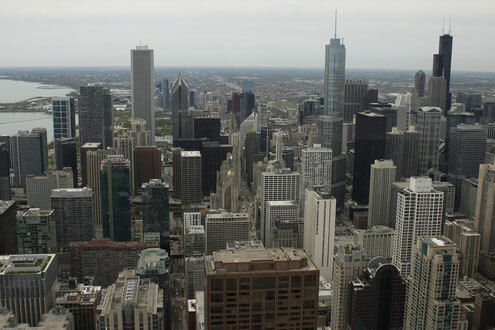 By the way: the first skyscraper that ever was built was invented in Chicago! But there’s a special reason why Chicago is looking the way it looks today: The Great Fire in 1871. Nearly 4 miles wide it destroyed large parts of Downtown. 300 people were killed, 100,000 homeless. The fire could even make it over the river because Chicago was very famous for meat production and all that animal grease in the water made it burn. 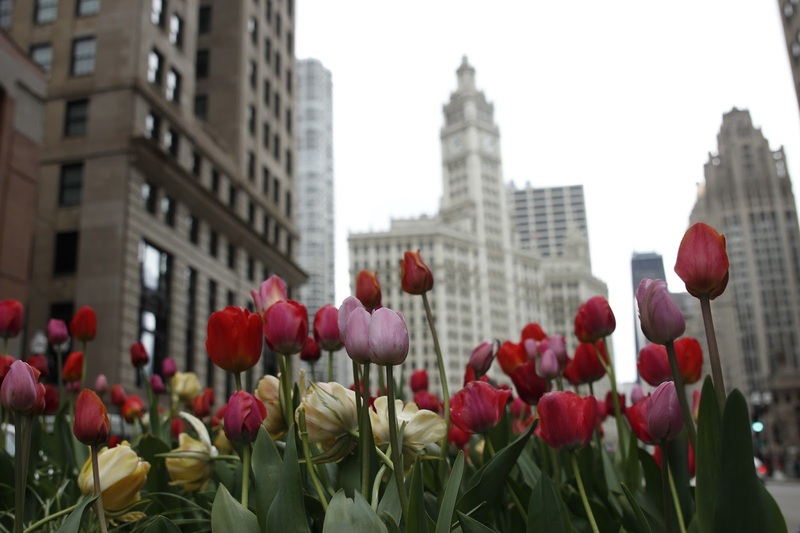 Only a few days later Chicago looked like a German city after World War II. The result? No wooden houses anymore! Many famous architects came and invented special steel constructions as cores of the new and higher buildings. But at the beginning they covered it with traditional stones because the people were threatened by the new architectural technology. When you’re strolling around Chicago today you will see many different eras of architecture. You will find a special, charming atmosphere and lots of lovely details. Something New York has lost a little – to my mind. Is it dangerous in Chicago? But also some new buildings are very well worth a visit. 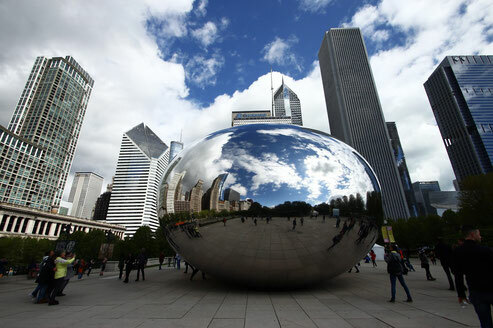 So is the Millennium Park, finished in 2004, with the awesome Cloud Gate. The skyline is glimmering on the reflecting layer of “The Bean” in one million facets like a diamond. And be aware – Crown Fountain is watching you! It is covered with changing projections of portraits. A little child was playing in the water and the faces seemed to smile at him. Oh, and please don’t believe those people who are still waiting for Al Capone, shootings and murder. When I was out at night only some kind people asked me if I needed help with my map (because I maybe looked puzzled at my phone) – that was all. Maybe it’s only Downtown and Pilsen but I have never felt unsafe in Chicago at all. To me the music scene has also been a very interesting thing because I’m deeply in love with Rock’n’Roll and Blues music. 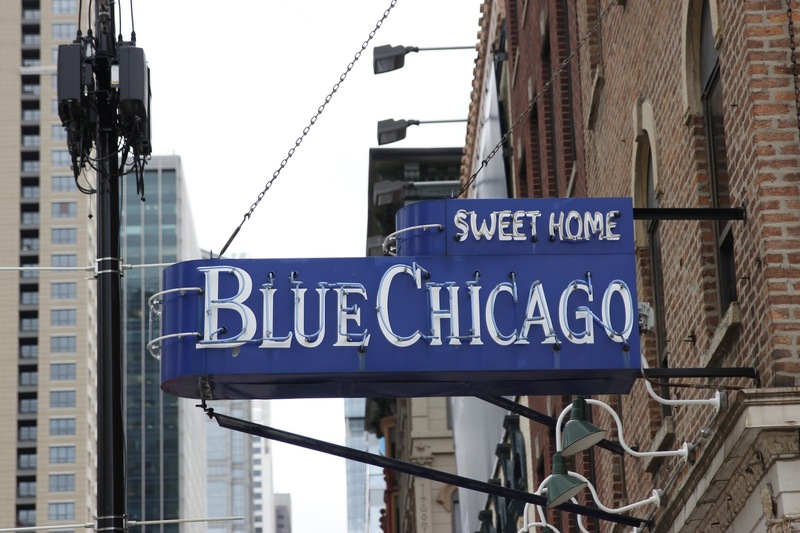 So I went to a Jazz Session of Students from a music university, to the legendary “Blue Chicago” and I had an amazing rainy Sunday morning at the “River Roast” with Mike Wheeler and his Band. I even visited “The Green Mill” well-known for being one of Al Capone’s favorite bars. I got lost into thoughts while listening to the beautiful live music. Sitting at the bar like an old grumpy man. That’s what can only happen in Chicago! So what else should you see? Everything! This city is a treasure chest filled with architecture, art and music. The people seemed to be a little rough and sometimes hard to understand but they were also very hearty. Definitely go to the Hancock 360° Observation Deck. I did not go to Sears Tower because it was the same thing as with Empire State Building: I wanted to have it on my photographs. Pick the Sun & Stars Pass so you can go up twice – at day and night. The view in the evening is simply stunning. Also do the Architecture River Tour departing from Navy Pier. It’s as good as a slow walk alongside North Avenue Beach with a great view to the skyline. So I remember an older lady I got to know somewhere during my trip. She was telling me “I love New York but my heart belongs to Chicago”. Same here. Chicago, you got me!